Drawing by Courtesey of Dorothy Rindos Kozlowski "58"
Milford is the 6th oldest town in Connecticut. On Februarey 6, 1639 Englishmen who had explored the area and set up camp south of New Haven Colony, joined with others from New Haven to purchase land from Anantawae, a Sachem of the Paugusset Indians. Sachem is a title bestowed upon a paramount chief among northeast American tribes. It is gained by vote or in some instances by heredity. The colonicts were interested in land on the banks of the Wepawaug River where Ansantawae's inland village was located down to where his tribe summered on what is now Point Lookout on Long Island Sound. The price they were willing to pay? Six coats, ten blankets, one kettle, twelve hatchets, twelve hoes, twenty-four knives and twelve small mirrors seemed reasonable. The tract extended from the east (Oyster River) to the Housatonic. It included not only costal plain land but also a small island offshore and a two mile "Indian Path" north to Paugusset (Derby). It is believed this pathway extended the purchse to include area now considered all of Orange and Milford as well as part of Woodbridge. An Audubon Society gem at #1 Milford Point Road this is an 8.4 barrier beach adjacent to a large wildlife management area and salt marsh. It is truly a birdwatchers' paradise; one that also provides educational exhibits, programs, and interesting events for adults, children. and families to enjoy. Summer canoe and kayak outings are a perennial favorite. Another is an Osprey Cam operated from an 18 foot tall nesting platform that can be watched on the web the world over. Closed on Mondays, the center is open Tuesday - Saturday from 10:00 AM to 4:00 PM and from Noon to 4:00 PM on Sundays. A boardwalk and observation platform with interpretive signage as well as a covered observation tower are open daily year-round from dawn to dusk. Located at 725 North Street, this park is a wonderful place for children and adults. Not only naturally pretty, it is well maintained. The nature trails, playground, and shelter for picnicking are all family friendly. There is even a pond, a tennis court, and a dog run. The Orchard is a 9 hole municipal course on what was once a North St. apple orchard. Great River Golf Club along the Housatonic at Milford / Orange town line is a Tommy Fazio designed course. Ed Austin, a Woodmont native and MHS "54" graduate was a long time Director of Milford's Department of Park and Recreation. There it sits just off shore, seemingly almost close enough to touch; but it now remains undisturbed. Except for the occasional wrath of Nor’ Easters and hurricanes, its tranquility is preserved ... as is its mystery. Mystery about strong swirling currents and a sand bar that disappears with every incoming high tide dominates local folklore. Alas, Milford's netorious sand bar which historically has left a multitude of people stranded and signaling for rescue, continues to claim victims each summer. Thus the sandbar contributes to Charles Island's intrigue as does a 1699 legend of Captain Kidd’s treasure. An unexplained closing of a Dominican Priests’ Aquinas Retreat in the 1930’s furnished fodder for years of gossip and speculation. Remnants of a chapel and bell tower were quite recognizable through the 1950's and 60's when people were allowed access to the island's interior. Milford's sandbar is a “tombolo”, a sand or gravel bar that connects an island to the mainland or to another island. Charles Island is only 14 acres in size yet it has a storied recorded history dating back to 1614. Named Quahog by Native Americans, it was the summer home of Ansatawae, Sachem of the Paugussett Tribe. In 1639 English settlers purchased the island as part of a large tract of land that they had named Milford. Subsequently the island was acquired by George Hubbard who in turn sold it to Richard Bryan. In 1657 Charles Deal bought the so-called Milford Island intending to grow tobacco. Although that venture was short lived, the name Charles Island persisted. Currently the property of the State of Connecticut, Charles Island has had 25 owners and many uses. At one point in time, it housed a popular hotel and served as a destination point for summer visitors who arrived not only by boat but by train and trolley car followed by a stage coach ride over the the sand bar. Charles Island is now protected as a wild life sanctuary. This is truly a Milford High School connected site. Developing one of our city's greatest treasures into a venue that all CT residents and tourists could enjoy was a dream of MHS "55" graduate and elected State Representative Gerald Stevens. However, it was not completed and opened to the public until long after Gerry's untimely death. Located on the city's west shore in an area often battered by violent storms, this otherwise serene landscape is now a destination mecca for wildlife as well as beachcombers. Milford actually boasts a coastline of 17 miles (much of it private). Often a specific building lot designated as waterfront includes beach property to the high-water mark. Other groups of building lots designated as communally owned and taxed beach property are deemed to be part of an association. Private marinas also dot the shoreline and extend up river to provide protection for water craft. Milford Yacht Club, Lisman Landing, and private marinas located where the Wepawaug River meets Milford Harbor are conviently located near Milford Center. GULF BEACH NEAR THE CENTER OF TOWN, HAWLEY AVENUE BEACH IN WOODMONT. AND WALNUT BEACH ON THE WEST SHORE ARE ALSO PUBLIC BEACHES WITH FREE PARKING FOR RESIDENTS AND TAXPAYERS WITH STICKERS. A PARKING FEE IS CHARGED TO OTHERS. This is a favorite Walnut Beach annual event. Participation is open to all willing to spend a day under the sun. 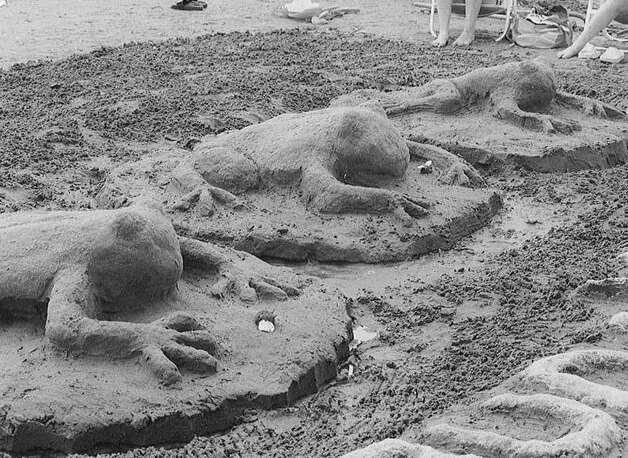 They start creating masterpieces in the sand early in the morning, wait patiently for judges to make decisions and award prizes, then sadly watch the incoming tide return beach to its natural state. Entry for contestants as well as spectators is free, however, non-residents are charged a parking fee.